Before or after your kitten or cat eats or drinks, it may paw, scratch, or knead the floor as if it is digging or burying something. This is not an unusual behavior; there's nothing wrong with your cat. In fact, your pet is demonstrating an instinct shared even by the big cats, and it is a very positive sign that it is feeling at home in your house. If you find the behavior annoying or disruptive, however, you can take simple steps to change it. What Is Floor Pawing in Cats? Many cats will scratch, paw, or knead the ground around their food bowl before or after eating. The pawing and digging is an example of instinctive behavior, meaning your cat probably didn't learn it from its mother. Some cats may take this behavior to an extreme, spending a good deal of time scratching at the floor or kneading the carpet around their food bowl. In some cases, cats will also drag objects such as towels on top of their food bowls. Cats all over the world demonstrate this behavior. It is similar to "food caching," which is practiced by the big cats. The leopard is best known for food caching, which involves store food high up in trees to keep away from lions and hyenas. The North American bobcat also exhibits this protective measure, covering the remains of its kill with debris to hide from other animals. If you put newspapers under the food plates, you may notice your cat scratching under the plate, shredding the newspapers, and even piling them over the food bowl to hide it completely. This is another type of "food caching." In some cases, cats will scratch at or bury food or other items they dislike. This behavior is similar to burying feces in a litter box or on the ground. Like caching, burying allows the cat to "disappear" by getting rid of its waste. In addition, as cats often sleep where they eat, burying waste can be a way of "tidying" a cat's personal space. It may not seem to make sense that a house cat without any threat of their food being taken would exhibit this kind of behavior. And, it doesn't make sense, really, except for the fact that the behavior is instinctual and cats do it naturally. Kneading, while it looks similar to pawing, is a sign of pleasure. Cats and kittens will knead one another by gently alternating their paws, much as a person might give another person a backrub. Kneading is a sign of contentment; when your cat kneads its paws it may be anticipating a pleasant experience (such as eating a meal). Kneading is more likely if the area surrounding the food bowl is soft (a carpet, for example). Neither pawing nor kneading is, in itself, a harmful behavior. It can't hurt your cat, and it's unlikely to cause you any harm. In fact, some cat owners simply find it cute. On the other hand, it can be annoying and can lead to a mess if your pet rips up papers or damages your carpet. If you feel the behavior is a problem you can take a few steps to manage it. Of course, it's not always easy to train a cat, but removing temptation can be an effective deterrent. Place food on a hard surface away from items that can be damaged or dragged to cover the bowl. 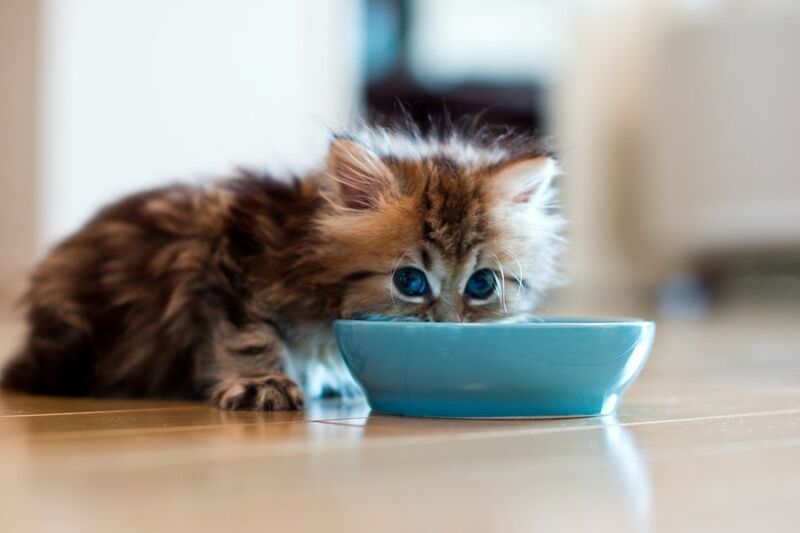 Stay with your pet as it eats, and remove the food bowl when it is finished eating. In general, it's best to put away wet food within a few minutes if it isn't entirely eaten, as it can easily spoil. If your cat begins to paw the floor, distract it with a toy or game. Avoid leaving dry cat food out for "free grazing" as this is likely to encourage pawing. Do not punish your cat for scratching or kneading, as it is a natural behavior and is not intrinsically harmful. Punishing your cat by spraying or hitting can actual lead to more problematic behavior and can, in addition, make it harder for you and your pet to bond.